If you are fortunate enough to have a cache of old family letters, you are sitting on a gold mine. Letter writing has gone by the wayside since the invention of the telephone, e-mail, texting, Twitter and Facebook. All those old family letters are something that should be preserved for future generations to enjoy. Other types of letters that you might have in your genealogy records collection could be war letters. War letters are not only important to your family history but to world history, especially if your ancestor talked about the war in their letters. Maybe you have a collection of college letters, these are letters written by your ancestor while they were at college. You could have vacation letters written by members of your ancestor’s family to your ancestor. You may even have love letters in your collection that tell of the courtship of your ancestors. 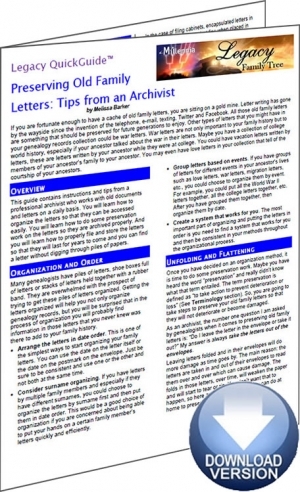 The�Preserving Old Family Letters: Tips from an Archivist�Legacy QuickGuide™ contains useful information including the best ways to preserve letters, especially folded and delicate letters. Also included are links to websites and resources covering archival practices, transcribing letters and more. This handy 4-page PDF guide can be used on your computer or mobile device for anytime access.